Free Fishing Reports > Northeast > New York > North Shore > After slow week, Bass returning! After slow week, Bass returning! After a slower week than normal, Ken, Tom and Don did some exploring to see if the Bass bite is picking up. To our surprise we got fish on the troll and a few jigging! Ken was high hook with a nice Bass on the jig. Hopefully the weekend and next week will produce some big slobs! 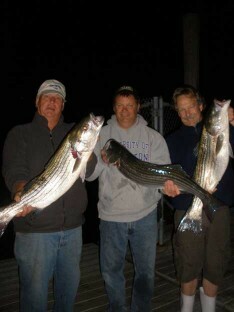 Kenny, Tom , Don with tomorrows dinner!